BBC's simply fantastic Sherlock series inspired me to revisit the Sherlock Holmes stories, and I was happy to stumble across some great new hardcovers from Barnes & Noble that collect all of Doyle's Holmes books into two volumes that cost only $8 apiece. 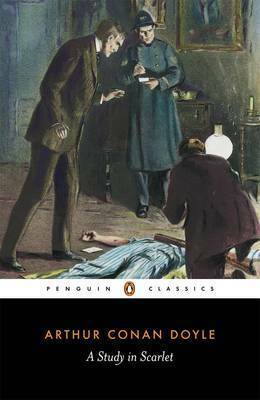 I started, naturally, at the beginning, with Doyle's debut Sherlock novel, A Study in Scarlet. Man, it's amazing he ever built an iconic series out of this book, as it awkwardly ports over the mystery of Edgar Allen Poe (who is namechecked unflatteringly) without carrying over much of the suspense. It hardly even qualifies as a detective novel, with Holmes solving the case almost instantly and Doyle dragging the thing out by suddenly diverting into a strange flashback that uses inaccuracies about Mormons to paint an unintentionally hilarious "sinister" portrait of the religion. Doyle would go on to make one of the most well-known characters in literary history, but you'd never know it just by reading this.